Viber is an instant messaging and calling app with 664+ million unique users in more than 190 countries. As one of the most popular messaging apps in the world, Viber decided to support its global growth with innovative revenue streams. 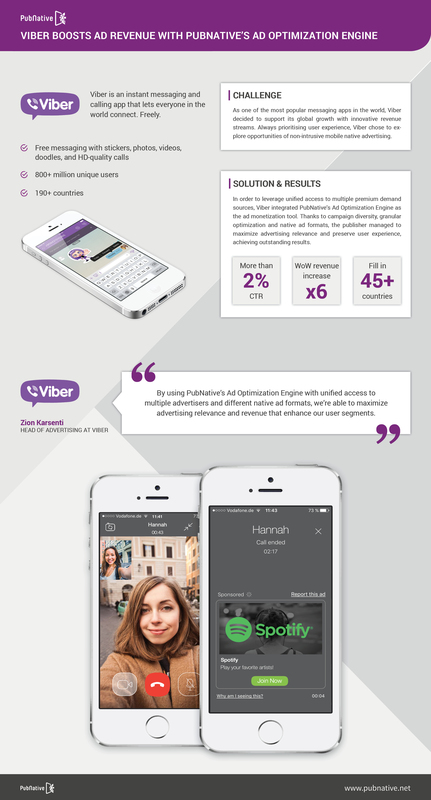 Always prioritising user experience, Viber chose to explore opportunities of non-intrusive mobile native advertising. Thanks to unified access to multiple premium demand sources, campaign diversity and granular optimization options available via PubNative’s Ad Optimization Engine, the publisher managed to maximize advertising relevance and preserve user experience, achieving outstanding results.